During the mid-fifties, the first windrow elevator was offered to the public. Mr. Curtis Clark designed what later became known as the Ko-Cal 400. The Ko-Cal description was derived from the name of a large company (Koerigh Company). Mr. Clark accepted the position of Vice President for the Ko-Cal people and agreed not to manufacure anything for seven years. After seven years had eplapsed, Mr. Clark became active once again in fabrication. 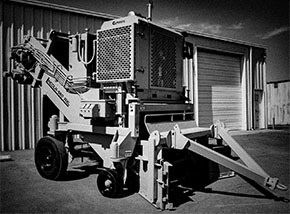 In 1965-66, the newly designed ClarCo windrow elevator hit the market. 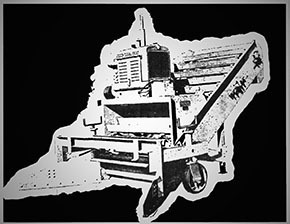 Clark's Welding and Machine sold the ClarCo products until 1976 at which time the company was sold. During the same time frame Mr. Clark also sold his automatic welding and fabrication business to the Lincoln Welding Company. 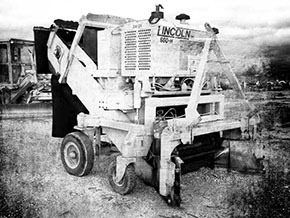 Shortly after the Lincoln Welding buyout, Lincoln started manufacturing the Lincoln 660 windrow elevators. Lincoln built the very popular 660 mechanical machine for about 10 years, selling the product to people like Caterpillar, Volvo, and yes, the Barber Greene people. They just painted them green. The newly developed Lincoln 660-H was efficient, dependable, and durable. During an onsite demo in Mississippi, Bob got a great idea! He figured out how to solve the problem of aggregate segregation.It began an 11 year process of engineering and design changes that would revolutionize HMA paving methods. First up was a dual drive conveyor head shaft that was necessary to accommodate his new inventions. At a demo on a Texas highway, Bob found himself standing 3 feet away from traffic with cars passing by at 75 mph "blowing our hats off." That's all it took - he went home and reengineered the instrumentation control panel moving it to ground level and on both sides of the machine to accommodate all paving senarios and keep people out of traffic flow. On a plane ride home, Bob was pondering the segregation issues of HMA paving and considering ways to bring it back to the middle of the material flow. He realized that when he's on the ranch cutting hay with the swather he is literally conveying the hay back to the middle... Bob pulled out a pen and sketched out a rough draft of our patented left/right auger system on the back of his napkin. A phone call from a frustrated customer struggling with rubberized asphalt while paving at night. He was having to take out the "clingers" (big lumps of asphalt) by hand while on the job. A couple of months later, Bob had developed our patented material modifier that could be added with a quick, inexpensive fix that simply bolted on to our patented remix auger.